As I have stated in the past, I am using this summer to revamp my school technology curriculum so I have been reading different books to find a theme for my lessons. 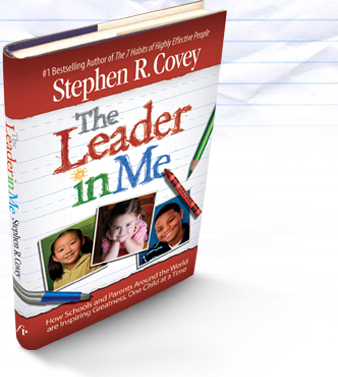 So yesterday I started to read the book The Leader in Me by Stephen Covey. I think this could be the one. I remember hearing about 7 Habits of Highly Effective People that Covey wrote back in 1989, except before reading the book I actually listened to the book on tape, which was read by Mr. Covey himself. The problem was that he talked so slow on the tapes that it was really hard for me to understand just how great his ideas were. So it was a few years later when I finally read the book for myself and really enjoyed the ideas and concepts in it. I never thought that the 7 Habits could be applied to young students, but a school principal did just that. She adapted the habits into ideas that students could understand and apply. In chapter one the book gives examples of how students improve by using these new habits, the greatest of which is an increase in state and national tests. Covey states that his program is not about standardized tests but is instead about making better and more employable adults. The increase in academics is just a natural by-product of the habits. Put First Things First: I spend my time on things that are most important. This means I say no to things I know I should not do. I set priorities, make a schedule, and follow my plan. I am disciplined and organized. You can see from the above habit that students could do a lot of great work with technology in my classroom. They could use their Google Calendar to set their schedule. I can't wait to finish the book and to possibly apply these habits to my new lessons.